This same failure has happened over and over, at one time or another in Russia and Mexico and now in Venezuela. Some tried to make it happen in the 1970's in the US, and Elizabeth Warren would still like to try, I bet. Socialists take over the oil industry and revel in the first months about all they money they are able to divert to "social" expenditures. Then, in a few year, it all comes crashing down. 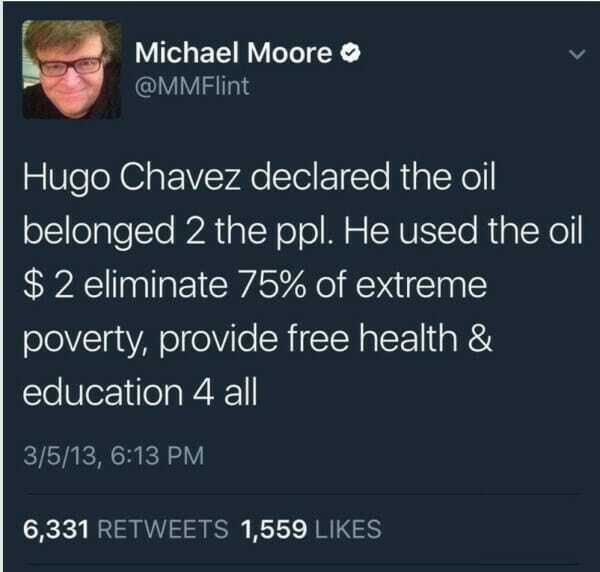 This tweet from Michael Moore five years ago gives you a good idea of the thinking. Socialists have always seen production and wealth creation as some sort of magic, a fountain in the desert where piggy rich people push to the front and take more than their fair share. Oil looks to them as the ultimate example of this -- wealth just flows out of the ground and evil rich people at Exxon grab it all for themselves. But in fact, oil is just the opposite of the magic fountain. It takes a huge quantity of money and brains to get even one drop of it in usable form to your car. Imagine trying to figure out where even to look for oil when it is hiding far under ground. Or having to poke holes a mile into the ground from structures standing in 1000 foot deep water in the Gulf of Mexico. And then transporting the oil hundreds or thousands of miles by pipeline and ship and train and truck. And then carefully refining the oil almost molecule by molecule in multi-billion dollar facilities. And then getting the usable parts to the right people, including distribution outlets for you and I on almost every corner of town. Right now gasoline in Phoenix goes for about $2.85 a gallon, which is about $2.40 before taxes. This is 60 cents a quart, which compares to the retail price of a bottle of water of about $2.00-$2.50 a quart. It's a freaking miracle of modernity that you can fill your car this inexpensively. Anyway, it turns out that oil is the ultimate "you have to spend money to make money" kind of business. And once you spend all that money, you investment immediately starts dying. Oil companies have to completely rebuild retail gas stations every 20-30 years. Refineries have to be constantly updated with really expensive improvements to take advantage of new technologies, to adjust to changing markets and regulations, and to handle different types of crude oil. And then there is oil production. Drill a well today and the moment you open it up, the production starts to fall off. The flow will drop, the percentage of water might increase-- a million things can happen and all of them bad. To keep wells flowing companies constantly have to reinvest their profits in reworking the wells (fracking and such) and adding enhanced recovery systems. As fields deplete, new wells have to be drilled in new locations or at new depths, or else whole new fields have to be developed to replace them. The "greedy and short-term-focused" oil companies reinvest much of their earnings to make sure the supply of oil is sustained. The "enlightened" socialists harvest all the cash they can and hand it to their cronies, allowing the production assets to fall apart and, eventually, their economy to collapse.